Auteur(s): Nicole D. Anderson & Kelly J. Murphy & Angela K. Troyer. Catégories Lecture: Plaintes cognitives et vieillissement et Vieillissement/Dégénératif. One in ten adults over 65 has some form of mild cognitive impairment or MCI – thinking problems that go beyond those associated with normal aging, but that fall short of the serious impairments experienced by people with Alzheimer’s Disease and other dementias. This is the first book written specifically for individuals with MCI, for their loved ones, and for the health care professionals who treat them. Written by three clinicians and researchers who have devoted their careers to MCI patients, this book provides up-to-date and reliable information on the nature of this disorder, how it may affect people, and what can be done about it. 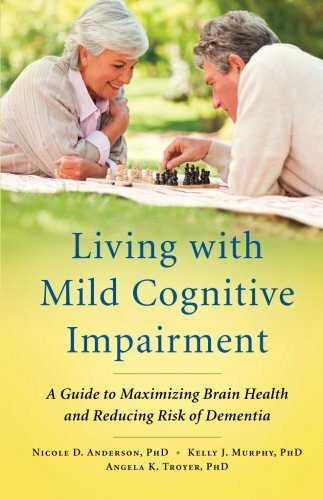 The authors explain how MCI is diagnosed and treated and they offer advice on how to improve cognitive health through diet and exercise, through social engagement, and through the use of practical, effective memory strategies. Throughout, case studies illustrate the real-life issues facing people living with MCI. The book includes “Questionsto Ask Your Doctor,” recommended readings and links to relevant websites, and worksheets to guide readers through healthy lifestyle changes.